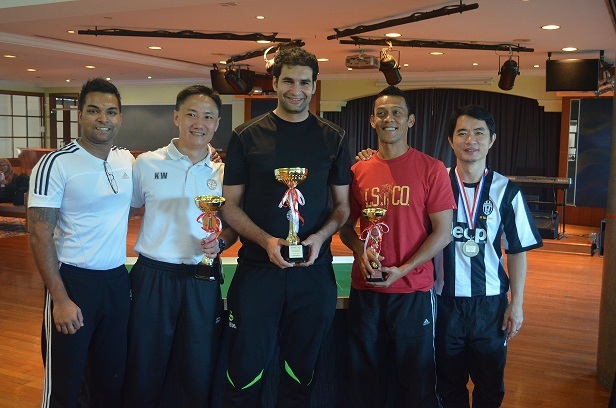 Last week-end the Singapore Association was the host of several tournaments. After a WASPA tournament held on friday and won by local legend Den Mulia, there was a FISTF Future on saturday with U19 players taking part in a event run in swiss format. 10 players took part and there were many close games. After the six first sessions, Mohd Azhar (Leste Aquila SC) beat Giovanni Choong (Singapore Lions) in the final (1-0) to claim the title. On sunday, 20 players attended the FISTF Satellite. There were 17 representatives from the host nations but also players from Hong Kong (Antonio Carabillo), Malaysia (Mike Dent) and France (Ouabi ROuis). After the groupe stage, the first surprises occured in the barrage round when Anas Rahamat defeated Antonio Carabillo. In the quarter-finals, Michael Choong managed to beat Rudy Hesty on shots. There were no surprises in the semis as Tan Kok Wee beat Micheal Choon and Ouabi Rouis defeated Den Mulia. In the final, Ouabi Rouis proved to be the most experienced player by defeating Tan Kok Wee (3-0). This entry was posted in FISTF News and tagged Results, Singapore. Bookmark the permalink.